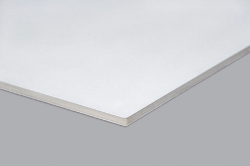 Kapa Line is a premium lightweight foam board sheet with high quality chromo substitute liners. Kapa Line foamboard lends itself perfectly for use in applications such as presentation boards, hanging signage indoors, mounting photographs, modelling and POS advertising. Kapa have been at the forefront of foam board manufacture for some years, and in purchasing their foam board, you can be safe in the knowledge you are getting a premium and high quality product that will excel in a number of applications.